When it comes to business, you always want to make a good impression. You need to come across as professional and responsible in the corporate world. Get a little help along the way as you climb that ladder to success with these five high-end items that will let people know that you definitely mean business. What businessperson doesn’t have business cards? If you truly mean business, then you’ll need business cards for anytime you meet prospective clients, business partners, or networking opportunities. But when you are in the office, you’ll want the perfect holder for all those professional cards and that holder is the Sleek Business Card Box. This stainless steel beauty has a transparent acrylic top that can easily be lifted so you can access all your cards for that next important meeting. Rather than having a plain, old, boring tape dispenser that exists in every office, give your workspace that modern feel and sophisticated look with the Bigfoot Tape Dispenser. 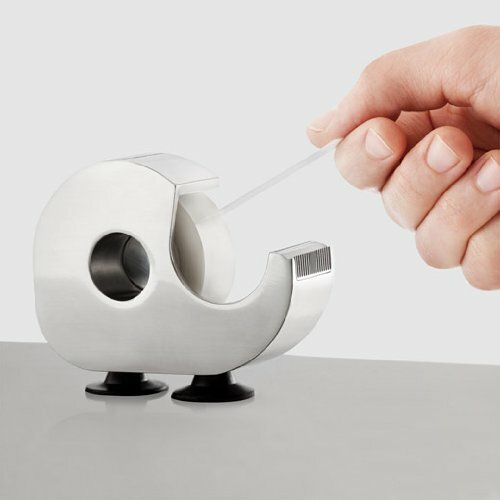 Stainless steel with die-cast aluminum, this little guy is sleek and fashionable, and brings a whole new level to the traditional tape dispensers. With suction cup rubber feet, it will also remain firmly in place so you will always have your tape at-the-ready. Whether you are the boss or just another employee, the odds are you will need to staple those important documents, contracts, and files. How about a stainless steel upgrade in the form of the Akto Stapler? This metal office accessory is stylish and strong and will take on the toughest of stapling jobs, making your work easier, and your workspace sleeker. Well, you have to have somewhere to throw out all those rejected ideas and failed attempts at brainstorming. Instead of a regular garbage pail, make your office into the modern marvel it should be with the Elan Blomus Pako Waste-Paper Basket. 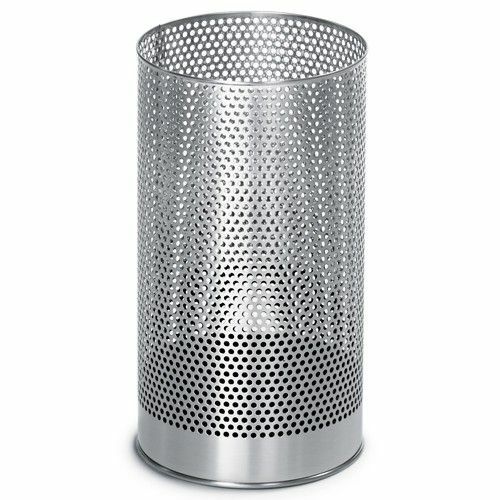 You’ll love the look and overall design of this stainless steel basket that has a streamlined appearance due to its perforated cylindrical body that will complement any office space nicely. You’ll need that perfect pad to right all those wonderful ideas on. The Muro Notepaper Memo Roll Holder gives you the elegance and contemporary look your desk needs at work. With its stainless steel design that just screams sophistication, simply jot down that reminder note, meeting time, or to-do list for the day, and rip it off when you are done. The roller will keep providing you with more space for keeping track of all those important tasks. With winter finally here, the temperature has turned cold, the mornings are chilly and the evenings have become frigid. As the snow steadily begins to fall and those sweaters, jackets, gloves, scarves, and boots are dusted off from last year, you’ll want something to really help warm you up. How about some creative and unique fireplaces to add some sophistication and of course warmth to your life this winter season. For those winter evenings when you want to sit out on your porch but still stay warm and toasty under the stars, the Oasis Indoor Outdoor Bio-ethanol Fireplace is a perfect solution. This portable fireplace is lightweight, easy to carry, and can be used both inside and outside. Place it on a patio table or set it on the ground and enjoy the warmth of this great fireplace on-the-go. Bring some style and sophistication to your fireplaces this year thanks to the Circum Tabletop Ventless Ethanol Fireplace. The cylindrical shape and glass barrier creates a modern and sleek look that can be enjoyed from all angles due to its design. With its freestanding capabilities, this fireplace requires no chimney, gas, or electric lines to work. How about a fireplace that can be mounted into your wall for a luxurious experience in your home. Add the style and contemporary look of the SoHO Wall Mount Bio-Ethanol Fireplace to any room and instantly get not only a fabulous way to warm up your house, but also an elegant design to add to your decor. Decorate your home with the look of fire without the actual fire with the Hanging Flame Lamp. Perfect for parties or outdoor gatherings, this flame-less lamp has the appearance of fire but is actually just a satin cloth with flickering lights to create the overall affect of fire floating in midair. Sleek, sophisticated, and stylish is what you can expect when you add the Madison Floor Standing Bio-Ethanol Fireplace to your home’s decor. This fireplace is ventless and can stand freely without any chimney, gas, or electric hook ups. The center black powder coated metal has the appearance of it suspended in midair between the glass sides, creating a cool look for your room. It is always fun to host a party in your backyard. You either barbecue on the grill or create a spread of delicious foods for your guests to pick from. As the daylight slowly fades away and gives way to the evening, you’ll need light in that yard of yours to not only see by but also keep you and your guest warm during those chillier night gatherings. Don’t let the party stop just because the sun went down with these five sources of illumination that will not only provide you with the light you need, but will also add a modern, decorative look to your outdoor living space. Line your garden, pathways, or driveways with a little light from the Orchos Garden Miniature Torches. These beautiful stainless steel mini torches will stand firm and strong in the ground, making sure you keep receiving the illumination you desire for up to 3 whole hours. Make your next party or gathering extra special with some help from these torches. If you are planning your next outdoor luau and want to frame your yard with tiki torches, forget the classic wooden ones you are used to and go more modern and contemporary with the Debonair Orchos Torch. Stylish, sleek, and beautiful to admire, let the flames dance in the night with this stainless steel version of a traditional tiki torch. Who says you can’t have a portable fireplace just as sophisticated as the traditional one attached to your house? The Hudson Indoor Outdoor Bio-Ethanol Fireplace was built to move both inside and out thanks to its lightweight, ventless, no gas or electric hook up design. With smooth tempered glass walls on three sides, wind won’t blow out this fire so you can stay warm and toasty late into the night. Perhaps you would rather decorate your patio tables with some wonderful light sources but just can’t seem to find ones that will fit that elegant style and contemporary sophistication you are going for. The Tabletop Stainless Steel Garden Torches are the answer to all your lighting needs. Enjoy your evening meal with some lovely lighting from these very sleek-looking lamps. Instead of a traditional firepit that you and your guests sit around on the ground, you can go modern with the FUOCO Tabletop Firepit that will get you off the ground and around the table. This stylish firepit has a solid black outer surface made from frost-proof pottery, giving it a streamlined appearance, sleek look, and durable design able to withstand the elements.